IN the chaos of modern living, a quiet corner for concentration is essential for maintaining sanity and order. The study is this "corner" and may be used for correspondence, reading or homework. Since it is a private retreat, this is the area to display awards and those personal mementos that motivate us to further our goals. The pictures show Moin Ahmed's house. The apartment, a 4-bedroom unit of almost 3000 sq. ft. is located at Road 11/A, Dhanmondi, Dhaka. The family has two sons. One son is abroad for education and the other lives with them. So, Mr. Ahmed was suggested to transform the 4th bedroom into a study, because his work requires a lot of correspondence. Once the functions are decided upon, one can draw a floor plan of the space available. A corner space was allocated for studies. A curved wooden floor step was installed. Synthetic wooden material was used for the floor covering. To match that, a beautiful curved ceiling with a louver patch was fitted in. The corner was instantly turned into a dramatic space. Creating the right kind of home office is a fundamental need that every home worker must meet. Anyone can pack all sorts of sophisticated equipment into a space, but making that space efficient and effective, as well as comfortable and appealing, is truly a challenge, as is finding an appropriate space in the first place. To design a study for your home, define exactly what activities the space is to serve. Some studies are purely family entertainment areas for television viewing and reading and, as such, are designed like a casual living room. Others are more serious retreats in which to conduct business and focus on a desk and organized storage for books and papers. Furniture and office equipment companies are beginning to produce beautifully designed scaled-down pieces that work splendidly in home-based settings. So, the homeowner here was suggested to buy very simple and space saving furniture. The table, made of glass and SS pipe, is very simple but eye catching and a space saver. As per space allocation a stepped cabinet for books, CD and family albums was made. A painting was also placed on the wall. This room situated in a part of this apartment that has relatively poor lighting. So a double door section was kept for openness, which gave the total area a more spacious appearance. The ornamental wooden door with glasswork creates an eye-catching effect. Curtains also important. Simple Roman blinds were used for the window. This is very flat design but the color is vibrant. The maroon raw silk matched perfectly with the cabinet. Take a keen look at electrical requirements, lighting and temperature control, especially for a study that is to house a personal computer. Different light arrangements were used for the study. Ambient lights were placed in the false ceiling and illuminative effect of the spotlights on the painting gives the total space a dramatic look. We also arranged a wall light opposite the study corner. But comfort, form, and function must converge in these pieces; workers want and need attractive furnishings that will not only transform areas of their homes into environments conducive to their particular working habits, but will also meet their aesthetic tastes. Color schemes for studies span the entire spectrum. However, your choice should take into consideration the amount of natural light the room gets, the size of the space and its purpose. If the room is to be a quiet retreat, then a less visually jarring decor should be planned. We used a very unusual color scheme of earthy brown tones for the study. The contrasting light and deep shades bring energy into the total atmosphere, making it very welcoming. So whether the room is used entertainment or personal correspondence, the energizing effect serves the purpose. Since the study is a more personal or family retreat, the display of private collections, hobbies, family memorabilia and personal awards is appropriate in this room. 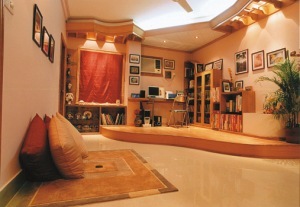 Consider it as the "inner sanctum" and let your imagination run free in its decoration. From the height of sophistication to peaks of fun and favorite, the choice is yours.